And I do love building, I tell you that. I would like to thank the Lego company for making me a build freak when I was a kid, back then it was Transformers, GI Joe and Lego. Ah, even till now I appreciate those 3 kinds of toys....going as far as making a display stand for my Nintendo DS with Lego's lol. The picture was taken for archive purposes, which is why many a Gundam are left out of view. I was in a hurry you know, I had very little preparation time to set up this picture, much less make a good view of it. Yes, this is the same table where I've featured my anime girl figures over the previous months. Now, let's go into details here on what is in the picture. Looking closely you can identify 3 1/144 Strike Gundams, surprisingly enough to each their own weapon pack XD, joined by a 1/144 HG Sword Dagger L. Although, upon further closer examination the Strike on the foreground, closest to the bottom is the HG one. Did you notice that right away? If you did you got a good Gunpla mind. Why? You'll notice how the Strike's are each painted a bit, but the #1 giveaway is the foreground Strike's feet positioning. Next up, the utmost rarity of my collection: My own-hand painted, 1/144 Gundam Seed MSV Sword Calamity Rena Imelia Ver mangatron. Buying what was possibly the web's last available Sword Calamity conversion Kit, I without a doubt bought two Calamity's, one for the sword, one for the druggie. I enjoyed every bit of time working on it, except for this one tiny little odd true fact: I only had the box and DVD on how to make this Sword Calamity, it was only till after doing the final painting did I find out that there was a Rena Imelia version almost like my paint scheme. Check out the swords on the back, as I pointed them upward for added cool effect. Next up, the wonders of my collection: The lineup of Big guys and other oddities. You'll notice I posed the big Gundam's from smallest to biggest, Nu-Gundam to 1/60 PG Zaku (Thanks to Buster gundam layout of bazooka's and Comm. Head crest). And yes, that 1/60 Strike Freedom you see is the Lightning Version, which was the first 1/60 I bought (and went 1/60 shopping crazy after that). You'll note that S-Gundam, and now about that Zaku: You'll notice a strange color it has, complete with transparency here and there. Well, I didn't like the pink colors, so I went with Phase Down grey, as if it has Phase Shift lol. The body had the real red I liked instead of that pink, which is why I left the red parts as is. the transparent parts are from the PG custom kits, this kit being #1 I think. With it the outer limbs are the only parts transparent, kit #2 has the rest of it. The two bazooka's came with kit #1, and the kit specifically said only one bazooka at a time. Hell, I said stick em both in lol. PG Zaku was my first PG kit :) with it followed the PG RX-78. nothing special to say about it except it took just about 5 hours to complete, even when using my advanced sprue-slice of the parts (Yes, I did use a vice tool. But it was finished off with a utility blade to smooth out the surfaces). That and the PG RX-78 is a simple, yet cool kit. Now about that 1/60 SF, you'll note it's the smallest of the 1/60's, yet after seeing this very picture only did I realize that the DRAGOON parts and wings are actually as wide, and tall at this kind of angle. It takes up an extra parading spot lol. Other oddities I would like to note is my Phase Down 1/144 Aegis, with only the head left in painted enamel Red lol. Can you spot it's most interesting feature? Hint: notice that both 1/144 no-grade Strike's are not holding their shields. Another interesting bit is the line of druggie suits, which I personally like them very much. 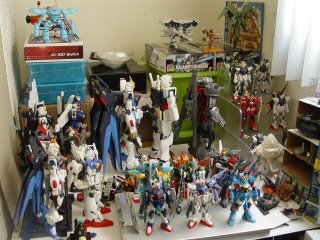 Also take note of the 1/144 Waldfeld's Gaia Gundam still in MA mode but standing up lol. Hey just a question, you know your HG strike 1/144, is it equipped with the sword pack from a NG 1/144 strike? It is the Sword pack from the NG 1/144 Sword Strike. The Gundam in the back all the way on the far left is the RX-93 Nu Gundam, and the one in front is the S Gundam, both are Master Grade.